My weaving mojo that is. 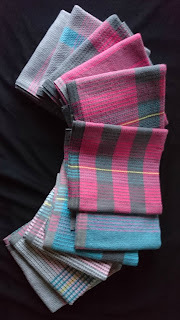 I found the Bumberet tea towels in the last post a bit laborious, they were on the loom from June to the end of October for 7 tea towels and a breadcloth. 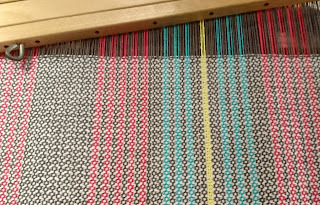 I know part of the problem was that there were a lot of colours in the warp and some of them were 4 strands of 20/2 cotton. Not all the strands lined up precisely and there were quite a few joins in the warp – note to self: just don’t ever do it again. So there were joins and loose threads and fishing weights hanging all over the place. Once they were off the loom, I put on the burgundy tencel warp I’d saved from the double harness project last year. It was the first time I’d saved a warp and it gave me no problems at all. 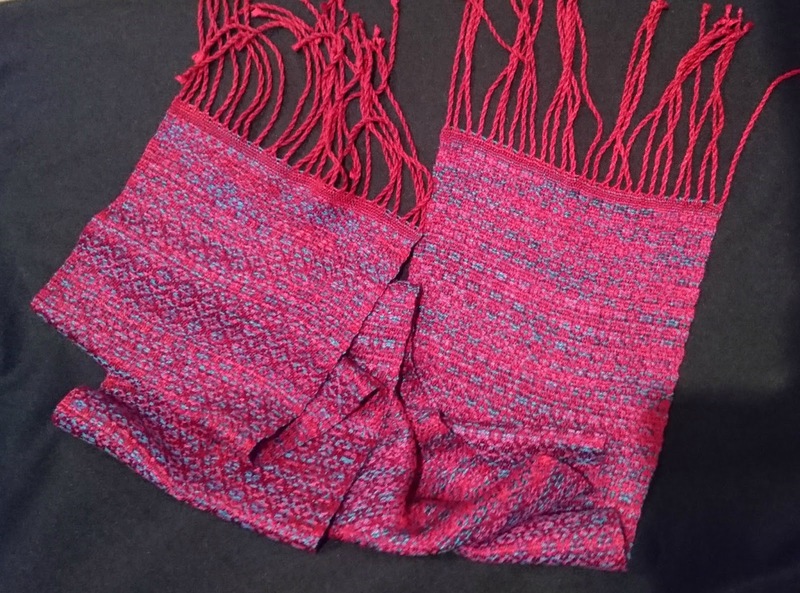 It was so nice to have something without loose threads and fishing weights and the 2 scarves were finished in no time. I used a draft from VAV and did one with a turquoise weft and the other with multi coloured tencel in jewel. Both turned out well although I’m happier with the turquoise. as there’s a battle going on between pattern and colour – as usual colour is winning. Clearly it's not nearly as photogenic. A couple of weeks ago it was Melbourne Cup day – a holiday for a horse race at just the right time of year to make Christmas cakes so that’s what I did. They need to be cooked very slowly so once there were in the oven I turned my attention to the next warp which was to be more tea towels for Christmas presents and for the December market. 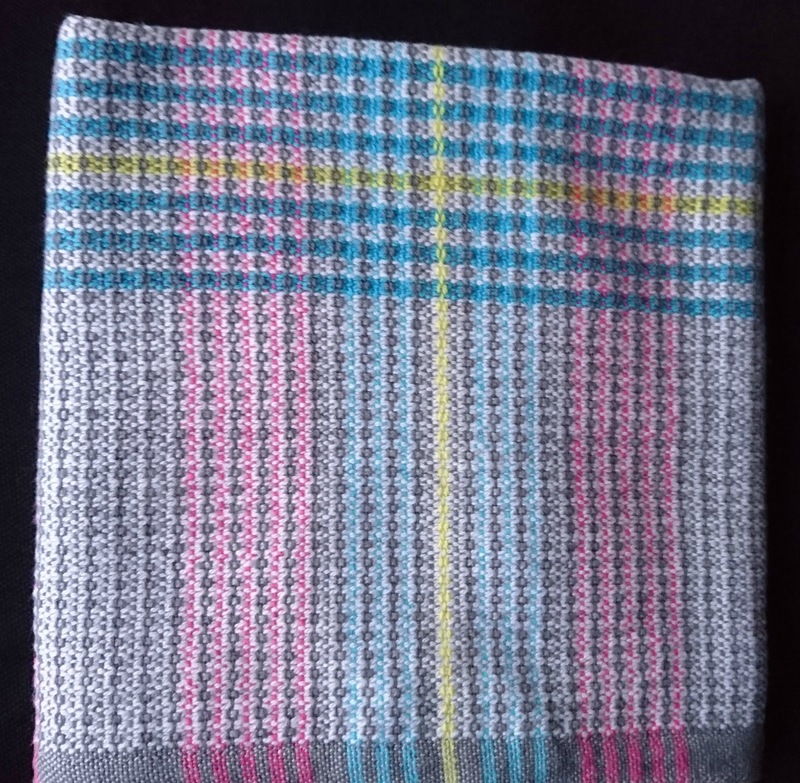 Despite my problems with the Bumberet tea towels I knew I wanted to explore it further so I planned a warp, all with yarns from the stash. 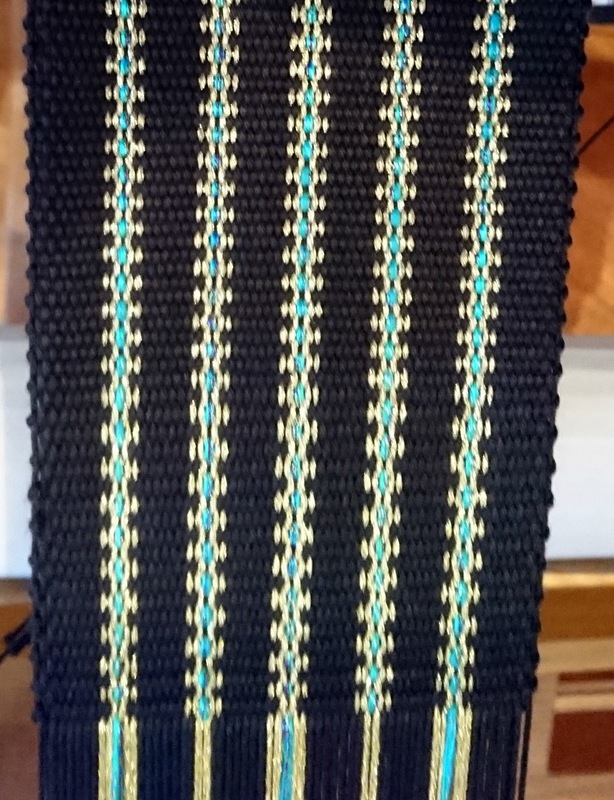 I did a couple of wrappings before I was happy with the colours – I wanted green but neither of the greens I had contrasted with the grey but the bright aqua was fine so I went with grey, aqua, rose and just a dash of maize yellow. I knew I had 2 cones of the rose and started with the smaller one but there wasn’t quite enough. I found the second one, hoping that it would be close enough in colour. It seemed fine so I checked the dye lot and they were exactly the same. I know I bought one from Halcyon Yarns in 2007 or 8 and the other from Village Spinning and Weaving in Solvang several years later. I don’t know if I was just really lucky or that UKI dye colours in very very large batches. 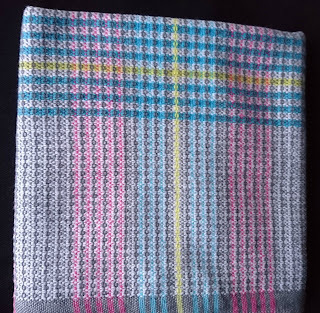 The Bumberet towels went really well – the colours worked together, there were only 2 threading errors and both easily fixed, the weaving was an easy 4 pick repeat and any errors were so obvious that they could be fixed without unweaving more than a couple of picks. There’s just one problem – they’re not the same as the previous Bumberet. I knew from the earlier towels that Bumberet needed groups of 3 ends and I planned and wound my warp carefully, taking the 3 end groups into consideration. I threaded it in groups of 3,4,3 and 2,1,2 and away I went. 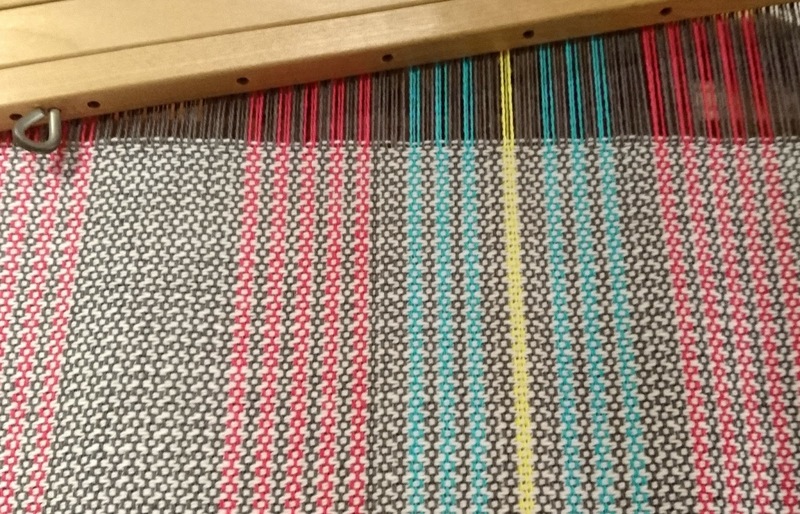 First I used a grey weft, just a little lighter than the grey in the warp, then white, then turquoise, then rose. The warp was behaving and the texture of the cloth was great but something told me that they were different from the previous ones. Eventually I looked at the draft I’d used for the previous towels and what I’d threaded was point twill – 2,1,2,3,4,3 – not the Bumberet I’d used last time which was 2,3,2, 1,4,1. This set me off on a search which turned up an article by Madelyn van der Hoogdt (it's at https://www.interweave.com/article/weaving/the-bumberet-family/) but Blogger won't let me provide a link and another by Alice Schlein that I will try to find next time I make it to the guild library. I now know that there are quite a few variations in the Bumberet family and the one I’ve used this time makes very nice, slightly textured tea towels with no long floats – what could be better than that? I finished 10 towels and a bread cloth easily in time for the market last week even though it was a challenge getting them washed and dried in the middle of a few very wet and humid days. I wasn’t too concerned when none of them sold, as other things sold and it means that I still have a nice selection of tea towels for Christmas gifts and I don’t have to make another batch in the next couple of weeks. It was the last market for the year and there had been a question about the plans for 2018. We received the good news that the market is moving back to its original venue after an absence of about 5 years and will now be known as the Hawthorn Makers Market – even though we had moved to the next suburb, we kept the name of the previous location in Hawthorn and were using the somewhat unwieldy title of ‘Hawthorn Craft Market – in Camberwell’. It will be good to move back home. 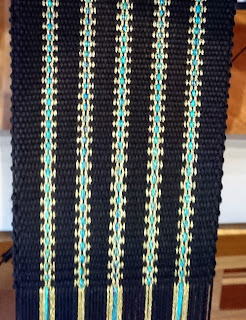 As I had enough tea towels, I made a warp for another batch of glasses cases instead. 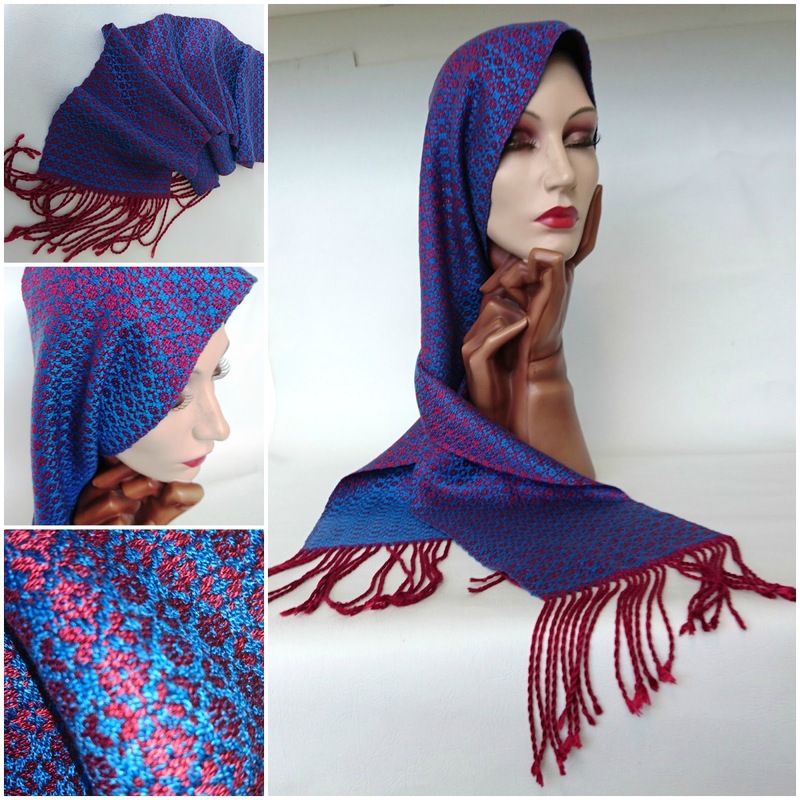 It’s simple plain weave, just the thing for a bit of relaxation in the middle of the silly season.